Triathletes face the daunting challenge of training for three disciplines - swimming, cycling and running. To do well they need to master all three forms of exercise and use all major muscle groups effectively in a single race. And after all that swimming, cycling and running training, a fourth element, strength training places the triathlete at a huge advantage. It makes their entire movement system stronger to make them a better all-round athlete - faster for longer and more powerful - whilst reducing fatigue and injury as they race their way around the course. What led you to training at UFIT? I asked an old football teammate (Darren Blakeley) for advice when I injured my back some 4 years ago. He recommended the UFIT physio Stephen Greenan, who in turn recommended I do Personal Training with Nathan post the initial treatment to focus strengthening for injury prevention. How has Nathan helped you prepare for your training, races and recovery? Nathan and I discuss what races are coming up, what we need to focus on for injury prevention and how to augment the triathlon specific training I do (swim, run, bike). We build some periodisation into the training to match race schedules and mix up the exercises based on what training I am doing outside the gym. I really appreciate the thought he puts into the personal training he has me do and working with him every week for 4 years means that he understands how I respond to sessions and therefore how to tailor the training. How do you prepare physically for your races? I leave the thinking around this to the professionals. I have a triathlon coach who is based in Australia. He sets me a program to follow that we discuss weekly. Each session is recorded and future session adjusted based on the data. I find being accountable to someone for completing the program they set, and being able to discuss training, nutrition and racing with a pro, really useful. He also adjusts my sessions based on travel commitments and helps set realistic goals and expectations. How have you balanced your strength training with Nath with ALL the running / cycling / swimming? Nathan has added in high intensity & weight/low volume exercises to help build strength without the fatigue associated with higher reps. For example he has me on the aerodyne bike (chunder bike) or the sled at the end of each session. Nathan referred me to research that highly recommends adding high intensity/weight training into the program because muscle loss and reduced bone density rates increase with age. Both of these are best addressed through high intensity and weights rather than long, slow training. HOW HAS NATH PREPARED YOU MENTALLY FOR YOUR RACES? Confidence is established by doing the personal training with Nathan, because knowing I have done the work provides the confidence that I will race well. If I am anxious I will go back and review how much training I have done, even comparing it to previous races. Goals is about setting realistic expectations based off the training. I keep this simple and limited to one or two things and my goals focus on the process not on the result. For example my running is weaker than my bike or swim so my goal for the run is to start with good form, build into the run managing my pace, then try and get “lost” in the zone – in other words don’t think, just relax. I keep cycling through this mantra of Form/Pace/Zone throughout the run. This means I focus on the process, letting the result take care of itself. Composure means not rushing and being able to adapt to changing circumstances – DON’T PANIC! If I drop a water bottle, think my way through the impact and what I can do. This might mean backing off the pace to limit dehydration. Being composed to me is being calm. I use a simple (perhaps silly) trick if I feel this slipping away – I smile (a genuine smile, not a grimace, gritted teeth smile) then my head lifts, my shoulders relax and I actually think more clearly and I am more composed. What do you enjoy most about your training with Nath? Turning up at 6am every Wednesday ready to go for 4 years takes a huge commitment from both client and trainer – Nathan gets it, and is always well prepared. His commitment provides me the necessary incentive not be late, or miss a session, or just go through the motions once I am there. I would never be as efficient or effective training on my own, Nathan’s knowledge, expertise and commitment means the results I get from training are worth far more than the cost of a personal trainer. What’s coming up next after such a huge racing year? How do you keep going between race break periods? Break periods??? I’ve discovered through painful experience that I need to train consistently rather than take a break and start up again. I may adjust intensity or frequency, but I need to maintain consistency across all disciplines even when not racing. The reality is that training for triathlons if often far more enjoyable than racing them, racing hurts! Not having a race coming up means I can train with a “just go out and have fun” approach rather than completing the session with a focus on the goal of the session. That in itself is a break. How do you fit all this PERSONAL training and racing in with a busy life? I train mainly in the mornings on week days as I can control the time I start work much better than the time the work day ends. This takes some discipline to establish the routine, but once it is a routine it is easier to maintain. I have a “low family commitment environment” each weekend as my wife, son, dog, etc live in Sydney. This has its pros and cons obviously, but allows me some quality training time on the weekends. My wife is an exercise physiologist and is incredibly supportive, although I do wonder if it is because she knows the more training I do the less chance there is that I am out on the lash. Is there anything about Nathan that surprised you or you would like to share with us? A lot that surprised me and nothing I can share. Training Gav for the past three to four years has been an awesome experience for me. It's great for me to work with such a fantastic masters athlete - and Gav doesn’t look a day over 54! As he mentioned, 6am every Wednesday we have both turned up consistently to work towards small, steady goals. During this period, I've learned a lot about the art of Triathlon and tried to apply as much of my knowledge of relevant strength and mobility training into each training program. Firstly, the injury prevention focus worked well and that allowed us to really move forward with increasing strength, particularly in the lower body and posterior chain. We have spent a lot of time on bodyweight mastery and I believe warming up every session with exercises like strict chin ups, L-sits, handstands, pistols squats and bridges have been paramount to building a solid base and are an important part of his training. 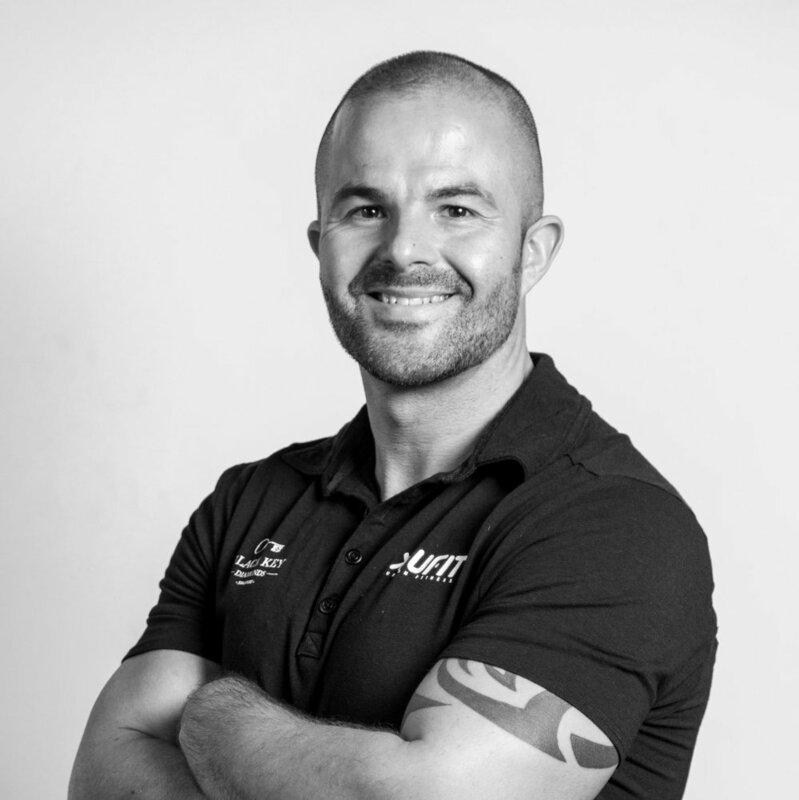 Gav has great knowledge of his body and how it responds to every training scenario and that has allowed us to continually improve without any clear side or backward steps. His results for 2017 were phenomenal (4 wins and 2 second places) and I must admit I’m quite proud each time I get a text from him after each race weekend because I know I’ve contributed a small piece to that result and I look forward to the successes in 2018. Why embark on huge challenges alone, when you can get experts to guide you - and your husband to join you? Robs Norris tells us how she lost 8.5kg and 4% body fat since doing the UFIT Body Transformation Program with her husband Sean, under the guidance of UFIT Head of Nutrition Wendy Riddell and UFIT Orchard Personal Trainer Tsvety Ivanova. 1. What made you decide to participate in this program? 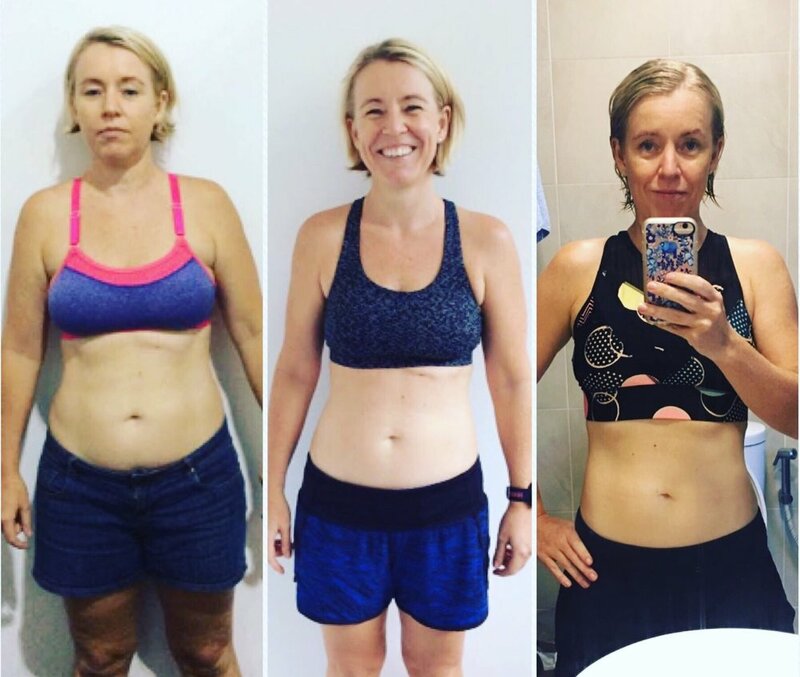 Robyn: I was doing HIIT classes up to 4 times a week, although I was getting fit I wasn’t able to shift the weight I had gained since having my daughter, I wanted to tone and build muscle and reduce my body fat. My husband and I decided to do this body transformation together as a team goal/life style change. Robyn's UFIT Personal Trainer - Tsvety: I was waiting for my body transformation client and then Robyn walked in. In my opinion, she didn't have much to transform. She was already in shape and was doing 4 times a week high intensity workouts. Not your typical body transformation client! Fat loss was her goal and I knew we had to do something different for her. Her program consisted of 3 times a week strength training heavy weights 8-12 rep sessions and one strong man conditioning session. I asked her to trust me and the results will come. 2. What’s it been like doing it with your husband? Robyn: Sean and I work well as a team, before we had our daughter we did a lot of running together but that fell by the wayside when we had Lennon. With Sean’s positive can-do attitude and my discipline we really do succeed. 3. How have you found the training process since you started - and has it been easier or harder than you expected?? Robyn: The first two weeks were really tough, my body ached in places it had never ached before and I was exhausted. But once my body got through that initial shock of training 4 times a week, it did get easier and more enjoyable especially when you start seeing the changes to your body and energy levels. Tsvety: Robyn is one of the most positive, hard working people I've met. Every hour in the gym with her just flies by (for me at least :-)). In just a few weeks the weights she was lifting were getting bigger and bigger and she was getting leaner and leaner. Now we have to ask the boys if they are done with the Dumbbells so Robyn can use them. 4. How has your diet changed and how have you found making those adjustments to your lifestyle? For the first 4-6 weeks, I adopted the no sugar, low carb, high fat diet and was pretty strict with it. Most importantly I cut down on the alcohol, which I found was the main contributor to my unhealthy eating. I found my appetite reduced significantly and I craved sugar and carbs less. I also started intermittent fasting which I found pretty easy to do. Now that I am working out 6 days a week and eat pretty healthy consistently I can now eat a few cheat meals and not worry about gaining the weight. But I do have to keep chocolate out of the house otherwise I will binge eat it all in one sitting. 5. How did you feel in the beginning - midway - and at the end? In the beginning I felt weak, exhausted and sore, half way I started seeing the results, the training became more manageable and enjoyable. And now I feel strong and more confident, I find the sessions enjoyable and I just want more and to continue to get stronger. 6. Have the results met your expectations? Absolutely and much much more. I actually didn’t expect to get the results I wanted so quickly, I thought I would struggle but once I started seeing results I just wanted to see more and that drove me on. 7. How are you continuing with it - what’s next? I have started triathlon training 6 days a week as well as 2 PT sessions. I had my first triathlon on 6 August where I came twelth in my gender category so I was really pleased about that! And then the ultimate challenge will be to do the Ironman 70.3 Phuket at the end of November with my husband Sean, so I am going to be kept very busy. 8. Who from UFIT DID YOU TRAIN WITH - and how did you find dealing with them? The gorgeous Tsvety Ivanova has been my Personal Trainer at UFIT Orchard and she has been nothing but amazing from the start. It's so important that you gel with your trainer and Tsvety made me feel really comfortable and confident and is extremely patient. I feel she really knows what she is doing and which areas of your body need more work. Tsvety may look kind and sweet but she knows how to push you hard in a training session. I did have a few ladies comment on how they would hate to be me when they saw the exercises Tsvety was making me do. Whenever my husband and I chatted about our day's training session I would say every time ‘Tsvety killed me again today’. With Tsvety also being a mum we have a lot in common to chat about during the sessions. Tsvety: In just a few months of hard work and positive attitude Robyn has completely changed her body shape and had exceeded the goals she had set. (Fitting into pair of her skinny shorts). She has not just dropped body fat but she has reshaped her whole body. There are not enough words to describe how proud I am of her. She had the goals in mind, went for it and reached them. And now we are onto the new ones. The UFIT Body Transformation Program does just that – transforms bodies, minds and lives! This fully personalised, all-inclusive fitness and nutrition program can help you make dramatic changes to your weight and body shape over a short space of time - in just 10 weeks. We will give you the guidance and support you need - and the more you stick to the program the better the results. It's all up to you! To take the next steps to a Fitter, Leaner and Stronger body just click here.